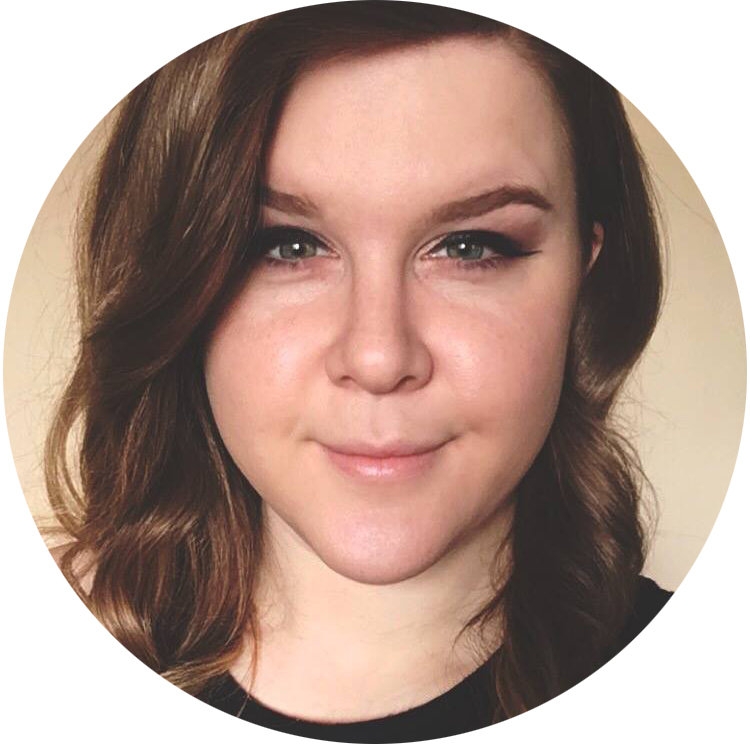 A bit ago, I got in touch with my dear friend Michelle of Sonoma Nail Art and asked her if she would be willing to create a polish that I could include in a giveaway. I had an idea brewing and knew that she would do an amazing job executing it. Luckily for me, she agreed to help! My idea was simple -- create a polish inspired by a chalkboard! 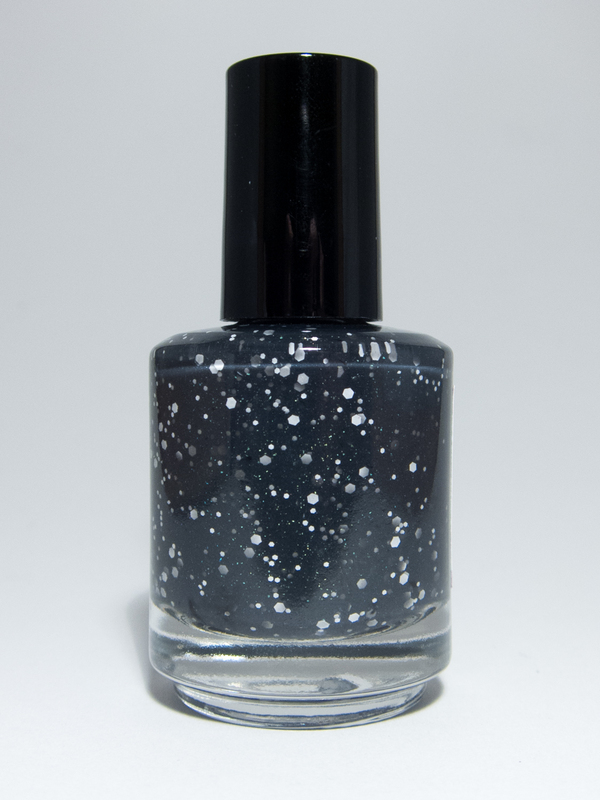 The polish contains the deep greyed black of the chalkboard itself, as well as "chalk dust" glitter pieces and pretty green flecks. The photos in this post show three coats of Sonoma Nail Art - Chalkboard Nails alone. Below is the bottle; Michelle made the label. How freaking cute, right?? I love the way Michelle executed this polish. I bet it would be cute mattified, not to mention a nice nod to the "chalkboard" theme! 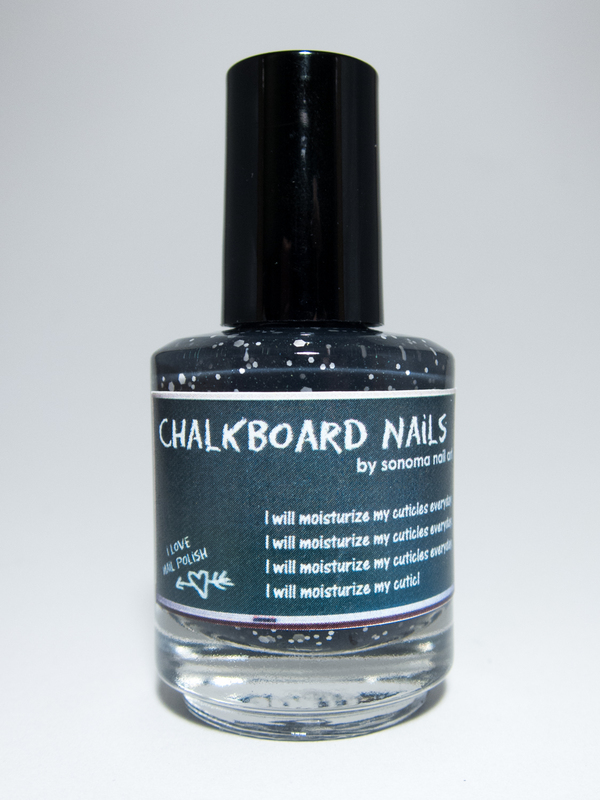 The good news is Chalkboard Nails will soon be available for purchase in the Sonoma Nail Art shop! The BETTER news is that five lucky people will win a bottle in this very post! Please enter using the Rafflecopter widget below. Must be a follower of Chalkboard Nails to win. Must be 18 years of age or older, or you must have your parent's permission to enter. This giveaway is open internationally, and closes on January 16, 2013. The winners will have 48 hours to claim their prize, after which new winners will be chosen as necessary. I had so much fun making this polish! Good luck everybody! What a cool giveaway! It's so original. Thanks for giving us the opportunity to own a unique polish. :) And how cool of your friend, to make this. I love the label on that so much! I'm crossing my nails that I win this, if not then hopefully it won't be sold out before I can get my hands on it! Love love love it!! Such a cute idea!! Aah! I love this!! Fabulous idea and excellent execution--this is beautiful! Gotta admit...I was super excited when I saw you were doing such a fantastic giveaway. Love Michelle's polishes. This one is just awesome!! Thank you so much for giveaway!!! That label is too cute! And the polish is gorgeous! How cool! I want this!! Thanks for the giveaway and to Michelle for making it! How AWESOME!!! You are a total nailebreity these days (you get what I did there? was it good or did it stink?). Thank you for the great giveaway. The polish is very pretty and the label is just to darn cute! That is soooo pretty! I heart it a lot! All fingers and toes are crossed!!! That bottle is seriously adorable! I love this polish. I can remember maybe 8-10 years ago when the stars on tv started wearing dark dark polish and I said OMG that is horrible. Now over half my stash is black, navy, and dark purple. Too funny!!!! 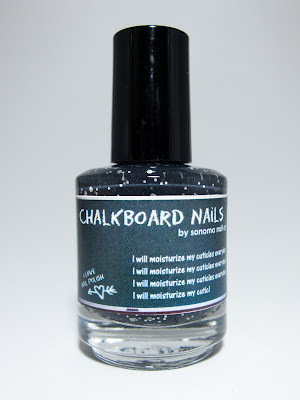 Wow this is a really gorgeous Chalkboard nail-polish. I joined the give-away. But still I don't think that I will be one of the lucky five, because I don't have a Facebook account. But hey! Goodluck to you all. Very cool blog I m always excited about new inspiration and tips! This giveaway is awesome! looks really gorgeous this polish. Awesome polish, as usual for Sonoma Nail Art. :-) Thanks for pairing up for a nice giveaway too! Go Chalkboard Nails! Gorgeous polish and super giveaway. Thanks Chalkboard Nails. I love this polish!! Thanks for the giveaway!! This is so fun! LOVE that label! Thanks for the giveaway! She did such a great job, it looks great! I would LOVE to see it with a matte top coat ;) Please show us? great , i love it ! What a great polish! And thanks for the giveaway :). How awesome to have your OWN polish! Love it! Great to get a chance to win this bottle of awesomeness!